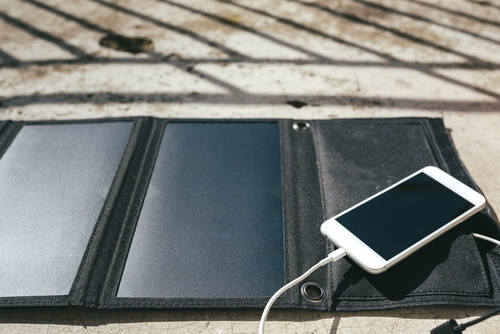 If you want to have amazing outdoor experiences while staying connected to your devices, it’s important to get yourself one of the best portable solar chargers of 2019. These offer reliability for long-term trips, and they allow you to continuously charge a portable battery or a smartphone. They’re also small in size and have lightweight designs for optimum performance outdoors. What devices can you charge? How much time do they demand to charge? How to know when the solar charger is working? Let’s get started with this comprehensive guide on the top solar chargers of 2019! The next important product in our list of best solar chargers is the product from Anker. As with the previous product, the Anker 21W dual USB has an energy conversion rate of solar power into electricity between 21.5-23.5%. Using 21W from SunPower solar cells, the product provides enough power to charge two USB devices simultaneously. This makes it the perfect charger for iPhone 7, Samsung Galaxy S7/S6/Edge and Plus, Nexus, HTC and more. Also, the Anker 21W incorporates the fast charging technology that allows it to deliver up to 2.4 amps per USB port under direct sunlight. Moreover, the simple design of the product makes it the ideal backpack solar charger. The compact size of 11.1 x 6.3 inches and the ultra-thin design of 1.1 inches when folded, offers portability and simplicity, making it suitable for the camper or the adventurous one. Lightweight is also an important property, representing only an additional 14.7oz of weight to your backpack. The Anker 21W has an incredible durability thanks to its PET polymer faced solar panels that are sewn into a rugged polyester canvas that provides water-resistant protection as well. The 40W X-Dragon solar charger is a remarkable power supply that every camper or RVer should consider purchasing. To maximize its power output, the X-Dragon is designed with solar panels from the top efficiency brand in the market, SunPower. The solar cells of these monocrystalline panels have a conversion efficiency that varies between 22-25% under direct sunlight exposition. Efficiencies are usually between 15-18%, which means that you could obtain up to 50% more solar power with these cells than with others available in the market. 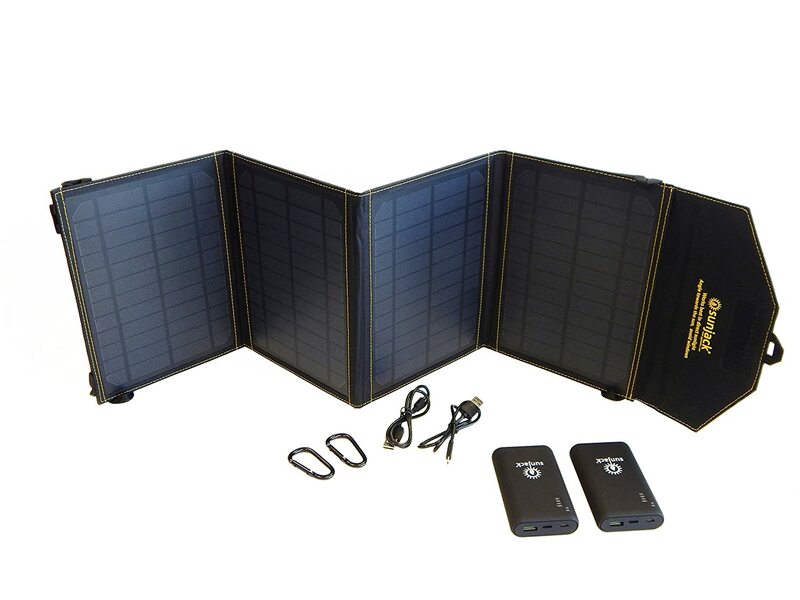 As with previous models, the product includes a dual USB port that has a 5V/2A output, but to be considered a good solar charger for camping, it also has an 18V DC voltage output that makes it perfect to charge electronics like laptops, tablets and other 18V devices or even 12V car batteries. The X-Dragon has also a built-in smart IC chip to optimize the distribution of electric current up to 2.8A under direct sunlight. My favorite feature about this product is that unlike other models available, the X-Dragon includes surge and short circuit protection for the panels and for the multiple devices that will be charging. Based on these features, you can consider this product as a great solar charger for laptops. RavPower Solar Charger is an American brand with almost 7 years of experience, delivering portable power banks and chargers for mobile devices to America and Europe, reaching almost 400 thousand members in 2018. This product has a high energy conversion rate. Designed with high-efficiency cells that can convert up to 21.5-23.5% of solar energy into electricity, this represents 23.7% more power conversion than traditional cells. Moreover, this device incorporates the Smart IC frequency technology which detects all the connected devices and efficiently distributes the current output up to 4.8A when used under direct sunlight. The compact size of the product is crucial. When folded, the dimensions are barely 28 x 12cm, a size that can easily squeeze in your backpack when you go hiking. Another important detail is weight. RavPower offers a product that has the perfect size for a portable power source. 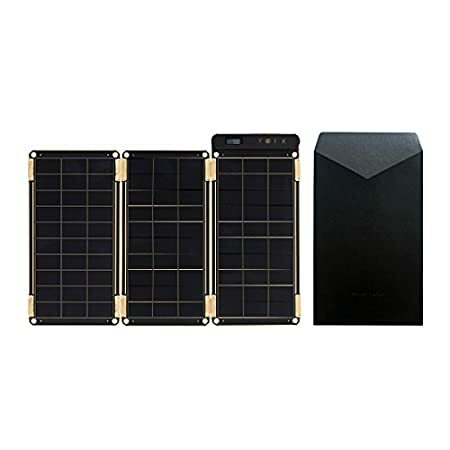 This outstanding but cheap portable solar charger has three integrated USBs ports of 5V DC and at least 2.4A to charge three USB devices such as iPhones, iPads, Galaxy Note, LG, and many other cell phones using the iSmart charging technology. This feature allows the product to detect the small device and adjust the maximum current allowed to increase the charging speed. The 20W SunJack solar charger is an amazing source of portable solar power for camping purposes. The product uses Sunjack small modules to provide 20W of power and 2 Amps per USB port that provide a fast charging speed, comparable with wall plug-in outlets. As a minimum requirement for solar chargers, the product is designed with a built-in smart IC chip to optimize charging and protecting as well as the prevention of overcharging. Sunjack designed the product to be weather-resistant and folding so that comprises to the size of an iPad to easily fit into any possible backpack. Moreover, the Sunjack module is shock and dustproof and has been even tested by the US Military. There is a reason why the Sunjack is a good resource of portable solar power for RV’s as well. The product includes two 10,000 mAh capacity power banks with Qualcomm Quick Charge 3.0 that will allow you to charge your phone up to 80% faster than any other standard chargers. This solar power bank charger will allow you to charge your smartphones up to 10 times even when the Sun is not shining. The amount of energy needed represents four 5000mAh solar chargers at an affordable price. The Nekteck 21W solar charger is a smart solution developed to provide portable solar power rapidly to charge your phone. The high-efficiency of its three solar panels is based on SunPower Maxeon technology, that allows them to reach 21-24% of conversion efficiency while providing enough power to charge two devices at the same time, using its dual USB 5V power output. The product is embedded with the smart IC chip technology (maximizing charging speed to 2A per port) and also has a durable canvas to withstand possible damages that could be incurred during experiences in the outdoors. Moreover, each section produces up to 800-1000mA under direct sunlight conditions, making it suitable to charge an iPhone, tablets and smartphones, GPS, cameras, and other USB supported devices. 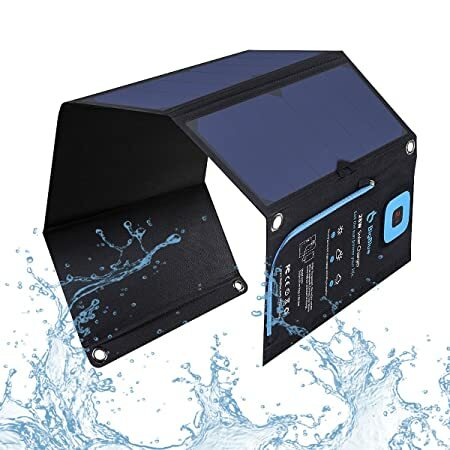 The universal waterproof solar charger also contains two outdoor hooks that can be used to hang the foldable modules on a tree, a tent, or inside the RV. Portability is also important for these types of products, and this is why having an ultra-light weight (18 oz) and compact size of 6.3x11x1 inches when folded is a remarkable feature of this product. Based on these features, you can also consider it as the ideal GoPro solar charger, since these cameras only demand 2.5W and need portability as well. 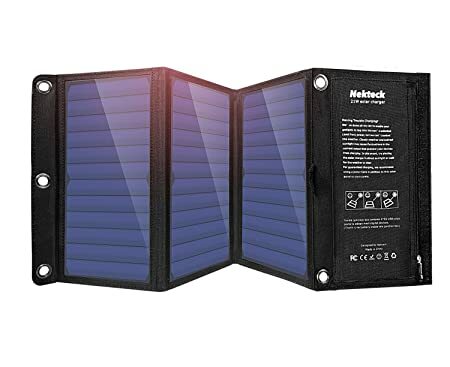 Moreover, if you are looking for solar chargers for hiking, then Nekteck is also for you. Foxelli offers one of the greatest solar powered portable chargers for the camper and the adventurer. Using polycrystalline panel, the Foxelli solar charger is able to charge up to two devices at the same time. Integrated with smart charging technology, the product powers devices delivering up to 1.85 A in total. 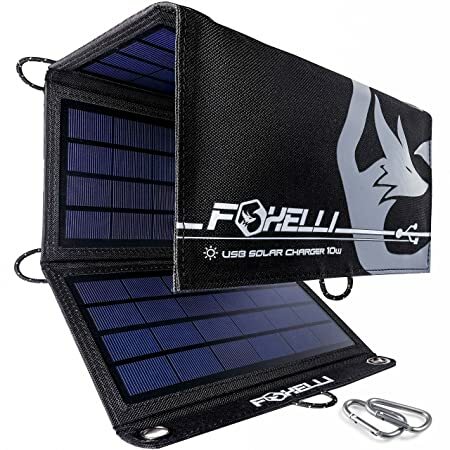 As with other portable solar chargers, Foxelli offers this dual USB charging ports option to the market to charge multiple devices such as an iPhone X, an iPad, Samsun Galaxy Note, Edge, mini, S8, S7, an LG smartphone, a GoPro camera, a Kindle, and other electronic devices. Given its power output, the device has a small size and weighs only 1.1 lbs. It’s ideal to use for backpacking, hiking, camping, or other activities since it has 11 built-in loops to attach the modules to the backpack. Another advantage is that the product is waterproof, which also makes it suitable to do other extreme activities such as kayaking or canoeing. And in case you are worried about its durability, you will realize that the PET polymer cover will make the panels resistant to water and even dust. The BigBlue is another remarkable product that uses SunPower solar panels with a 21.5%-23.5% conversion efficiency to provide off-grid power for many outdoor activities such as camping, climbing or even fishing. Integrated with Smart IC technology, the portable solar charger assures the fastest possible multiple devices charging speed up to 4 Amps. Moreover, the product is equipped with a special PET Polymer surface with an industry-strength that protects your device from any damage. It additionally guarantees IPX4 waterproof level protection. Considering the 28W power output available, the weight of the device exceeds the expectations at 21 oz, and the folded dimensions are 11 x 6.3 x 1.3 inches. The dual-port power applies to all the Android devices, making it the ideal solar cellphone charger. Additionally, this product has an interesting feature. Unlike other products, the product includes an ammeter to verify the actual electric current production of the solar panel. Typically when you charge an iPhone it will demand 1A, and with the ammeter, you will be able to check the values between 1A-0.8A. This will also become handy to check if the device is working or not. One of the most important variables to consider at the moment of choosing a portable solar cellphone charger is the weight of the device. Depending on the outdoor activity that you want to do, the weight will become less or more important. For instance, if you are looking for a solar charger for camping purposes, a lightweight device will not be as crucial. You will be able to place the device hanging on the tent or in the ground, and if you want to save it, you can simply put it back inside the tent or the RV. But if you are going hiking or trekking, every additional gram counts. The best solar chargers for backpacking must be lightweight, and it must also be the first variable to take into account. Otherwise, you will start thinking that the charger does more harm than good. Another important factor is the portability of the charger. Here, two aspects enter into the scenario. First is the way that you can carry the device. Some products have included steel loops that can be used to attach the device to a backpack or to hang it on a tent, but many do not include this feature. When you go to the outdoors there are high probabilities that you will have to carry water, bags, lanterns and other things, and is most probable that your backpack will eventually get full with other stuff. Therefore, adding a charger inside the backpack is not always possible. The best solar charger for hiking should have included a steel loop or steel eye-holes for easy carry on the exterior side of the backpack. In other words, the ability to hang the device is very important. However, if you are going camping, this variable could be considered as an additional since the device won’t be constantly moving and won’t represent a valuable space inside the backpack. The second is the size of the USB solar charger. Unfolded dimensions are important to have an idea of the surface area needed to start charging multiple devices. That being said, folded dimensions are also crucial since they will give you a reference of how much space you will need in your backpack or in your tent. The next thing that you need to look at are the specs. The efficiency of portable products is essential. This is a parameter where you cannot save expenses because doing so will imply a disappointment in performance every time. Decent efficiency values should be between 19%-25%. In this case, purchasing brands that use cells manufactured from the most efficient brand in the market (SunPower) is probably a good idea since you will receive additional power. The power output is also very important since it will give you an idea of whether or not your device is able to handle a single USB device or if it will be able to charge multiple devices. Another important detail is the accessories that the product includes. Does it have a single USB port? Or dual USB ports? Are there any adapters included? Does it have a built-in LED light or any other features built-in? Considering any valuable additional feature or accessory included without representing an important additional cost is a variable to take into account in the selection process. Cigarette lighters, overcharge or short-circuit protection, or power banks are typical accessories or features that are always well-received by the customer. Finally, given the nature of the activities and the environment where the chargers will be performing, there is absolutely no doubt that having a weather-resistant charger is a crucial factor to take into account. Many products have a PET polymer-based protection that guarantees that the panel will be guarded against any possible damp or drop in hard landscapes. Take a look at this feature. Also, if you are going to practice kayaking, fishing, or sailing, make sure that the product you buy is waterproof. What can you Charge With Your Device? 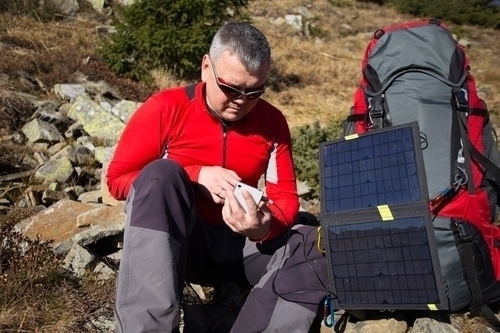 A solar charger is the best source of electricity to power multiple devices when you go on a camping trip or a journey to the wild for several days without any available power source nearby. Power banks can also be included in the list as part of the loads, but can also act as the power supply for all the loads mentioned above when they are fully charged through solar energy. How Many Watts Does a Solar Charger Need to Have? The answer to this question varies depending on the device that you want to charge. Most smartphones demand an average of 5 W. However, some smartphones and especially the iPhone 8-X may demand more power. Regarding amps, most smartphones will draw 1A or less, but in the case of an iPhone or another device, the current demand could be bigger. Since the maximum power output cannot always be expected, it is recommended to have higher wattage. Most chargers will have a wattage above 10W which should be enough to charge two simple smartphones. 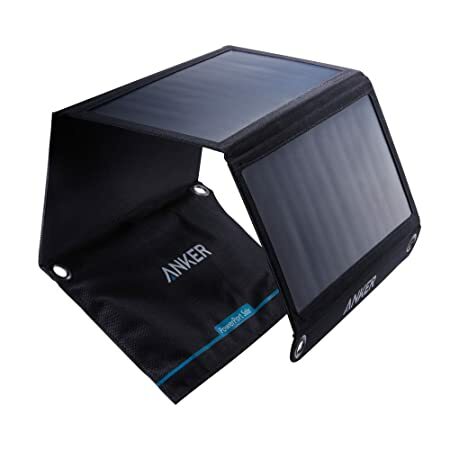 If you are looking for a solar charger for an iPad or tablet (regularly demand 5V and 2A, meaning 10W) you will probably need 15 watts of power. And if you are looking to charge laptop computers, you will probably need a 25 watt charger with an additional inverter to pass from DC to AC. All of this, increases the size of the modules and reduce its portability, keep that in mind. How Long do They Usually Take to Charge? Charging times depend on many factors: available irradiance (sunny day or not), the efficiency of the modules, device charging speed, whether or not you are applying multiple device charging, the capacity of the power banks, charging capabilities and more. PBC is referred to power bank capacity and PG Solar is referred to the power generated. For instance, if the power bank has a capacity of 2,000 mAh (multiplied by 5V = 10Wh), and the charger has a 10W power output, we can make this simple calculation. How Fast do They Charge Your Phone? As another example of the section above, we can assume that the smartphone battery has a capacity of 3,000 mAh (average iPhone or smartphone capacity). Now, if we know that the solar battery charger is constantly producing power at 5V, then 1-hour produces 1,600 mAh (8Wh/5V). To reach the 3,000 mAh of the smartphone’s battery, it would need approximately 2 hours to complete the charge. How Do You Know When It’s Charging? Sometimes the deal with portable panels is that you don’t know whether or not they are producing power. There is no machine rotating or expelling gases, so how can you make sure if your cell phone solar charger is working? Very simple, take a look at the LED indicator. Many solar chargers have an LED indicator that tells you whether or not your product is delivering solar energy to your multiple devices. Generally, the green light means that the product is converting solar energy to charge a battery. But, other times it is the red LED indicator the one that turns on when the charger is working and in some cases, it is a blue flashing light as well. This will all depend on the product that you purchased and it should be visible in the instruction manual of the device. If for some reason, the product does not feature built-in LED, then there are two other ways to make sure about it. The simple one is to use the USB connections to charge the smartphone and verify if the charging is done. And the most accurate one is to use a multimeter to check the parameter values (current and voltage) and jump to the conclusion. What is the Most Powerful mAh Device? The most powerful mAh solar charger is the one that contains the highest power bank capacity. The most reliable and available product with the highest mAh is the CXLiy Portable Charger Power and Solar Charger with 25,000 mAh of energy capacity. The product has a relatively small surface area and has two USB ports that can be used to charge multiple devices when fully charged. It also features built-in LED lights for illumination and SOS lights as well. Besides, its light weight and portability make it the perfect solar charger for cell phones. The warranty provided up to 24 months is also another interesting feature to take into account. It is important to mention that there is a difference between the most powerful mAh charger and the most powerful watt. The first one acts as a great solar battery, able to store a lot of energy to charge multiple devices, several times, but the instant power output to charge the power bank will probably be low. The second one is referred to as a product with the highest instantaneous power output. 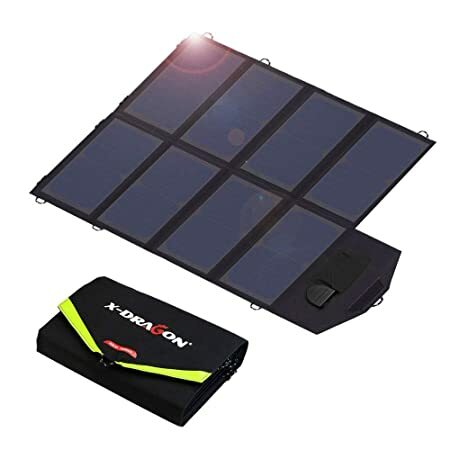 Based on this, we can select the X-Dragon as one of the best available choices in the market that will allow you to charge a phone, a tablet, an iPad, a laptop and so powerful as to be considered as a 12 volt solar battery charger. What is the Lightest Device? Based on our top 7 list, we can conclude that the brand that offers the best balance between power output and weight is the Anker 21W Dual USB small portable charger. 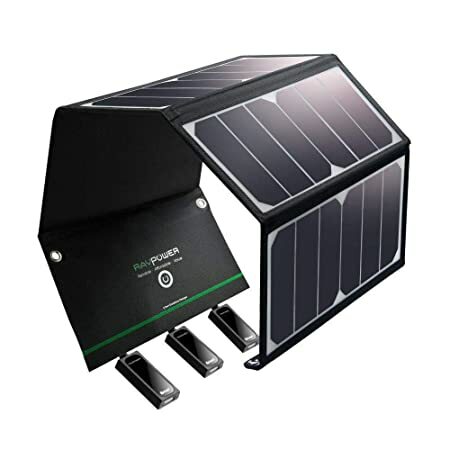 As we discussed in the product section, this charger has included solar panels from SunPower at a maximum efficiency of 23.5%, which maximizes the power output that the cells can produce, and reduces the size of the product as well. However, there is another product that offers the lightest and most reliable solution for the entire market: The Solar Paper by Yolk Station: considered as the world’s thinnest and lightest solar charger. At only 4.8 oz., it also has a 0.4-inch thickness with a 5W power output and 1A output. The charger does not have an integrated battery and features 23.7% efficiency values with an LCD amp meter that shows the charging speed. The solar paper is only enough to charge a phone, but you can add more capacity by using expandable magnets that will give you enough power to charge a tablet (including 2 or 3 solar papers).